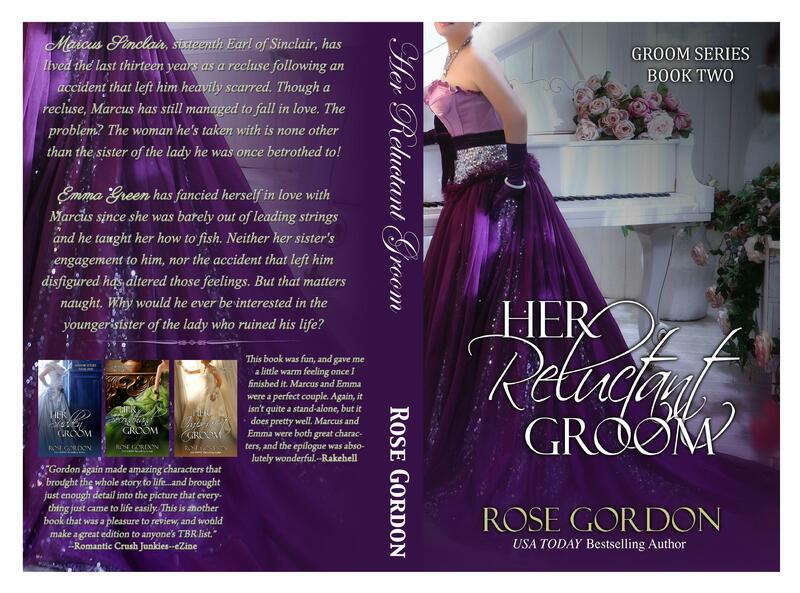 This week, I’ll feature the second book in the Groom Series, Her Reluctant Groom. The hero in this one is Marcus, Caroline’s cousin and the heroine is the neighbor, Emma Green. “Always.” Emma lightly placed her fingertips in the crook of his proffered arm. “It smells good,” she commented as they neared the dining room. “What can you stand to lose?” she asked, grinning. She twisted her lips and tapped a long, slender finger against her cheek. “I don’t know,” she admitted at last. “I have nothing nearly as valuable to offer you,” she explained, breaking eye contact. “I don’t have anything,” she said with a hard swallow. In her eyes, he read the truth. Something terrible had happened between her and Louise, and she truly had no real possessions. None of the tangible variety, anyway. 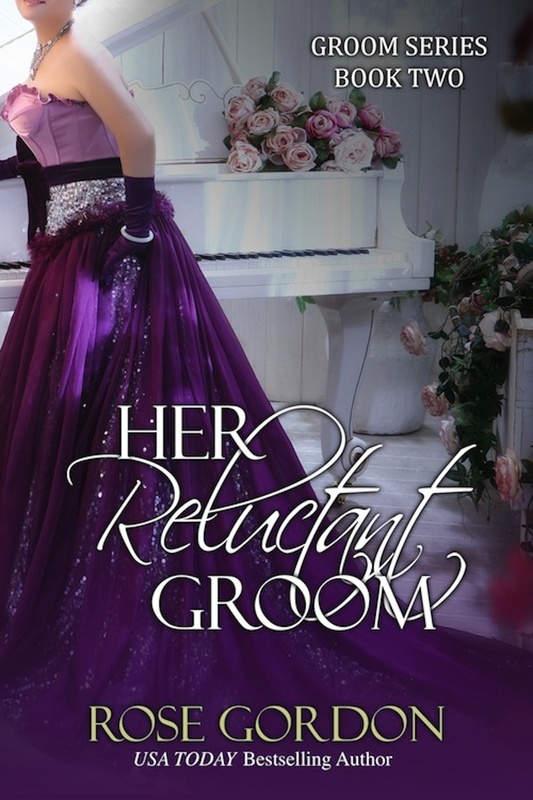 That must be why she was so willing to accept a gown from him, even if it was the furthest thing from proper for an unmarried lady to accept such a gift from a man who wasn’t her father, brother, or protector. “Shall we?” she asked, gesturing to the open dining room that was less than four strides away. The dining room at Ridge Water was gigantic by anyone’s standards. When Marcus ate alone, he’d sit on the end seat. It felt like it was a mile between him and the chair across from him at the other end. He hated it. He hated the solitude and loneliness that came with it. He’d attempted to rejoin Society several times since his accident. But every time he tried, he was met with either queer looks and disparaging remarks, or snide and mocking comments about how he’d ruined his entire life when he was barely eighteen. Thus, he continued to live as a recluse and hadn’t ventured to London for anything other than urgent business for more than five years. Before Caroline married and Olivia left, the three of them would take their meals at one end of the table. He’d sit on the end and they’d sit on either side of him. Occasionally Emma would stay for meals and would sit next to Caroline. Tonight there would be a bit of a different seating arrangement. He’d ordered the footman who’d laid out the table to put the two place settings right across from each other. He just hoped the man understood he meant across the table widthwise and not lengthwise. If not, they would both be eating their meal in solitude or have to shout to be heard by the other. He grimaced. Neither of those options sounded particularly appealing. Blessedly the footman had understood Marcus’ directive, and two settings were across from each other near the end of the table closest to the door. “Let me get your chair,” Marcus murmured, shooing the slightly shocked footman away. Emma sat down and waited while Marcus took his seat and nodded for the footman to serve up the first course. John, the recovering footman, stepped out from the corner and brought over to them a small platter with a big, shiny silver dome on top. He held it out between them and slowly lifted the top to reveal a warm plate of biscuits. Marcus shot Emma a triumphant smile and swiped a biscuit. Emma stared at the plate of offending biscuits. “Go on, take one,” Marcus encouraged, grinning. “I just can’t believe it,” she muttered, picking up the one closest to her. John put the serving plate back on the sideboard and brought over two little dishes. One dish was filled with butter; the other contained strawberry jam. Rolling her eyes and mumbling under her breath, Emma picked up her knife and slathered some strawberry jam on the top of her biscuit. Three bites later, Marcus motioned for the serving of the second course. John walked back over to them. This time with a much larger dome-topped platter. He removed the lid to reveal two bowls filled with what looked to be salad. Emma smiled sweetly as she took her bowl and set it down in front of her. Marcus slipped his off the tray and peeked at Emma as she stared blankly at her salad. He tried to keep his grin in check as he picked up his salad fork and speared a piece of slimy, brownish lettuce. A minute later, she pushed the bowl away. “I believe I’ll wait for something a bit more nourishing.” She glanced at the remaining five covered dishes. Next, John brought coddled eggs, followed by turtle soup, then kippers, which was chased by broiled duck breast. “Hmm, what do you suppose is under the last dome?” Marcus asked an impatient-looking Emma. She shifted in her seat. “Roasted chicken,” she said flatly. “I’m listening.” He put his elbows on the table and leaned forward. She wet her lips. “No matter what that last dish is, if I’m able to drink this entire glass of lemonade I’ll get two gowns, and if I can’t—” she shrugged— “I’ll give you two kisses.” She held up two fingers and shook them for emphasis. Marcus glanced at their lemonade. Neither of them had so much as touched their glasses. Judging by how bad the tea was earlier, coupled with how terrible every other dish served tonight was, neither of them had wanted to hazard a sip of their lemonade. And a hazard is what it would be, he was certain. More than three times in the past week alone, he’d snuck down to the kitchen to make his own lemonade. She picked up the first glass and brought it to her parted lips. She paused for a second, then tipped her head back and guzzled the liquid torture in the most unladylike fashion he’d ever witnessed. She brought the empty glass down with a hardthwack and glanced at the other while she wiped her sourly twisted mouth with the edge of her napkin. She glanced up at him and smiled weakly, blinking back the tears that had formed in her eyes from the sour lemonade. Without looking away, Emma picked up the second glass and proceeded to drink every drop in another long, continuous, guzzling gulp. “You win,” he conceded with a dim smile, motioning for John to bring over the chicken. Emma put her glass down and allowed John to serve her some of the chicken breast. “I’ll not cost you too much,” she said quietly. “Thank you for your generosity,” she said solemnly, stabbing a piece of her chicken. Marcus nodded and ate his chicken. There weren’t many dishes his temporary cook could make, but roasted chicken was certainly one of them. “You’re right. I’ll just be on my way.” He scooted his chair backward and stood up. He’d been building castles in the clouds, thinking she’d want to talk to him while they waited. “Wait, Marcus.” She gained her feet and came to stand in front of him. She blinked at him then an unusual, almost nervous smile spread across her lips. She cleared her throat. Then again. “Marcus,” she began, her voice terribly uneven for having cleared her throat twice before speaking. “I just wanted you to know the reason I drank all that dratted lemonade wasn’t because I didn’t want to kiss you, but because I need those gowns.” She came up on her toes and softly pressed her supple lips against his rough cheek.